LoRa technology allows utility companies to receive information over much longer distances than traditional solutions with a highly optimized current consumption both with the physical communication layer and the LoRaWAN™ specification. In water and gas metering, this translates into a much lower deployment cost and lower end-node cost due to reduction in battery sizes. In electric metering, it is a solution to connect nodes, which are not reachable by mesh or PLC, or a solution for control and communication in the case of outages. Many metering companies are looking to combine LoRa, PLC and Mesh technologies to provide redundant and optimized hybrid solutions for electricity meters in order to compensate for hard to reach nodes. LoRaWAN gives metering companies comprehensive coverage that is resilient to outages, remote locales and more. 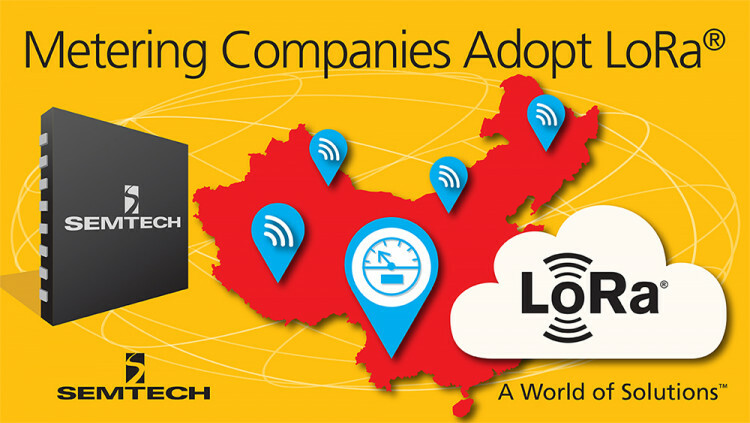 Semtech recently announced the EV8600 dual modem (PLC+RF System-on-Chip) featuring LoRa wireless RF technology, the first fully integrated PLC and LoRa modem for smart grid, smart metering and IoT applications. The PLC+RF System-on-Chip with LoRa technology enables virtually 100 percent connectivity coverage with a single chip. All statements contained herein that are not statements of historical fact, including statements that use the words “offers,” “allows,” “looking to,” “to develop,” or other similar words or expressions, that describe Semtech Corporation’s or its management’s future plans, objectives or goals are “forward-looking statements” and are made pursuant to the Safe-Harbor provisions of the Private Securities Litigation Reform Act of 1995, as amended. Such forward-looking statements involve known and unknown risks, uncertainties and other factors that could cause the actual results of Semtech Corporation to be materially different from the historical results and/or from any future results or outcomes expressed or implied by such forward-looking statements. Such factors are further addressed in Semtech Corporation’s annual and quarterly reports, and in other documents or reports, filed with the Securities and Exchange Commission (www.sec.gov) including, without limitation, information under the captions “Management's Discussion and Analysis of Financial Condition and Results of Operations” and “Risk Factors”. Semtech Corporation assumes no obligation to update any forward-looking statements in order to reflect events or circumstances that may arise after the date of this release, except as required by law.